If engine oil becomes turbid and white, it is highly probable that it is contaminated with engine coolant. Repair or replace damaged parts. Check for engine oil leaks around the following areas. When checking engine oil pressure, shift position should be вЂњPвЂќ (CVT models) or вЂњNвЂќ (M/T models), and apply parking brake securely. 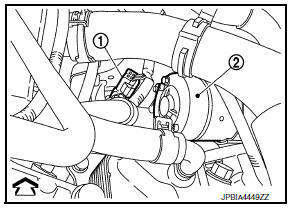 Disconnect harness connector at oil pressure sensor (1), and remove oil pressure sensor using a suitable tool. Do not drop or shock oil pressure sensor. Install Tools (A) and (B). Check engine oil pressure with engine running under no-load. When engine oil temperature is low, engine oil pressure becomes high. Engine oil pressure : Refer to LU-17, "Oil Pressure". If difference is extreme, check oil passage and oil pump for oil leaks. Remove old liquid gasket adhering to oil pressure sensor and engine. Apply liquid gasket and tighten oil pressure sensor to specification. Use Genuine RTV Silicon Sealant or equivalent. Tightening torque : Refer to EM-94, "Exploded View". After warming up engine, check that there are no leaks of engine oil with engine running. Prolonged and repeated contact with used engine oil may cause skin cancer. Try to avoid direct skin contact with used engine oil. If skin contact is made, wash thoroughly with soap or hand cleaner as soon as possible. Warm up the engine, and check for engine oil leaks from engine components. Refer to LU-7, "Inspection". вЂў Engine oil capacity : Refer to LU-17, "Oil Capacity".